Does a degenerative meniscus tear need surgery? Degenerative meniscus tears are very common. Many adults over 55 have one and will not know it. Degenerative meniscus tear surgery is rarely necessary. Most research shows that people do just as well with physical therapy. One of the most common knee problems an Orthopedist sees in the office is a degenerative meniscus tear. A meniscus is a cushion inside your knee. It aids in the stability of the knee and minimizing the stress across the knee, thus minimizing the risk of developing osteoarthritis. Meniscus tears are incredibly common. Although meniscus tears occur in all age groups, they are most common in adults over 55. There are many different types of meniscus tears. By far the most common tear is a degenerative tear of the posterior horn of the medial meniscus. A recent article published in the New England Journal of Medicine out of Finland studied patients with degenerative meniscus tears. They studied whether the results of an arthroscopy (surgery) was better than a sham surgery (where the patient is brought to the operating room and thinks they had the surgery). A popular surgical procedure (arthroscopy) worked no better than fake operations in helping people with one type of common knee problem (degenerative meniscus tear), suggesting that thousands of people may be undergoing unnecessary surgery. These findings are not new, but in this environment perhaps they will shine a light on the over-treatment of degenerative meniscus tears. In 2007 a study showed that the results from an arthroscopy for a degenerative meniscus tear were not superior to a supervised exercise program. Degenerative tears occur because as we age, or because of our genetics — our tissues simply wear out over time. A degenerative tear is frayed, worn out tissue that looks like the worn out area on the front of your blue jeans. It has very little character, and the tissue is thin, soft, flexible and looks worn out when we view it at the time of surgery. For many many years, I have spoken to people about the fact that many meniscus tears, especially degenerative meniscus tears do not often require surgery. Do I Need Surgery For a Degenerative Meniscus Tear? One of my most popular videos on YouTube is about this very same subject. Many patients are under the assumption that because something is torn, therefore it must be fixed. That is not the case for many issues in Orthopedic Surgery. This paper on the non-surgical management of degenerative meniscus tears versus surgical management is yet another in a series of paper that supports the non-surgical management of degenerative meniscus tears, especially in the setting of osteoarthritis. Despite how severe your pain is at the onset of your symptoms, typically within a few weeks, your knee feels much better if managed by physical therapy, ice, heat and anti-inflammatory medication (if you tolerate it). It must be pointed out. The authors of the paper studied degenerative meniscus tears. They did not study the more unusual “radial”, “flap”, or “bucket-handle” tears that can occur in the meniscus. These other tears can be far more “unstable” and produce mechanical symptoms such as instability, buckling and giving way. In those instances, a meniscal repair, or a removal of the torn flap will more than likely be necessary. This is an important paper, but far more study is necessary. 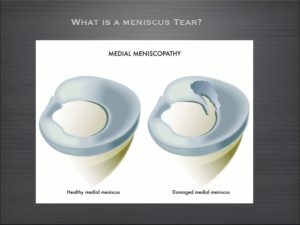 The take-home message is simply that all meniscus tears do not need surgery. Degenerative meniscus tears are usually managed well without surgery. When your visit with your doctor be sure to ask what type of tear you have. If you possess a degenerative tear, without any of the mechanical symptoms we mentioned — you should pursue non-surgical treatment at first and I think you’ll find that you’re glad that you did. This is good news for physiotherapy and exercise. I remember in Sweden there were a discussion with orthopaedic surgeon regarding this subject. Some of the surgeons asked what they should do instead if not operating meniscus tears. But the conclusion that more studies are necessary is of course true. Which subgroups with meniscus tear would need surgery and which patients would benefit from conventional care. My MRI report said I have Radial tear of the posterior horn of the medial meniscus at its posterior root ligament attachment. I fell ok , it bother me just a little in some position.Not big deal. After lot research included your web site(thanks), it does not seem to need surgery as the doctor said. Renata… Root tears are a different issue altogether. When the root has detached the entire meniscus is not functioning. Many surgeons can perform “root repairs”. Many cannot. You should seek out the opinion of someone capable of performing a root repair and review the studies with them to determine the right treatment for you. Many patients with degenerative meniscus tears will not need surgery and will do fine after a number of weeks of therapy, braces, etc. Once people return to a more comfortable state most of us allow them to return to their walking activities. Many find wearing a sleeve to be very useful, some do not. If it’s not too tight, there is no harm in doing so. I have not tried any physical therapy. I do visit to a gym regularly and among other things use the quad and hamstring machines and weighted toe raises. I avoid squats, treadmill and elliptical machines My upper body routine consists mostly of free weights. My ortho said arthroscopic surgery to remove the damaged parts of the meniscus is indicated but is not urgent. The procedure would take about 20 minutes and full recovery at most 6 weeks with a bandaged knee, perhaps needing to rely on a cane at first. I have no problem with those things. My concern is that we are planning a trip to France in September to explore Burgundy aboard a drive-it-yourself canal boat for three weeks. If I don’t have the surgery done soon and the knee acts up badly again it would hinder the vacation. If I do have the surgery done, there is not very much time for complete recovery, and it could be equally bothersome. My ortho said there is no harm in putting things off as long as the pain is tolerable, which it currently is. However, given the relatively short window before our canal trip and the unknown of whether the issue will return before or during that time, would you advise having the surgery now or wait and see what happens? ahhh … i face these situations every week. It’s a tough decision, but a decision you need to make. Many people live long happy, productive and active lives with a meniscus tear, some do not and opt for surgery. “Flap” tears can be annoying… much more so than “degenerative” tears — but time will tell. Hmmm… I’m thinking of calling the orthopod’s office tomorrow to schedule the arthroscopy. My reasoning is that if it needs doing the sooner the better, so I have a decent window for adequate recovery before leaving on Sept 29. I’ve been in contact with the doc’s secretary all last week, asking her if he would be comfortable with a more conservative approach first — a trial of PT without surgery. Apparently, his mind is already made up — or he is too busy to provide an answer. Meanwhile, it’s not the knee joint itself that bothers me as much as a gnawing ache radiating into the soft tissue above and below the affected joint: i.e the upper posterior calf and lower anterior quad. That’s what makes sleeping uncomfortable rather than direct knee pain. I have to decide one way or another and real soon. What would be a reasonable recovery time to expect from the surgery, which would entail several weeks of post-op PT? I know everyone is different, but having a rough “guesstimate” would be very helpful in deciding whether to jump right in now or to wait. Hi Debi .. Degenerative changes means that you have osteoarthritis… or the loss of the some of the cartilage that was on the ends of your bones. Hello, I live in the UK and have been unable to walk without a limp since June 16th. The MRI shows an extensive lateral meniscus injury (due wear and tear) with almost total loss of meniscus anteriorly and a generalized loss of articular cartilage with associated osteophytosis and degenerate change. I also have a small tear in the posterior horn of the medial meniscus. I’m only 43 but – used to – do lots of jogging and walking. I was scheduled for an urgent arthroscopy but in the end cancelled when the surgeon told me he might have to remove all the meniscus (he suspected a discoid meniscus) and that I might still be in pain afterwards. What is the point of surgery then?!! Do I really have no chance but loose all my meniscus? Could I have a collagene implant instead (the rim of my meniscus is still intact I think). My knee locks and hurts easily so I’m having to be extra careful with my movements, and when I have to walk (I walk as little as possible), I always do with a straight leg. Thanks so much for any comments, it’s been very difficult to cope with the enforced immobility. The issue you need to review with your surgeon is the impact that the osteoarthritis will have on your overall success and recovery. With generalized loss of cartilage and osteophytes your arthritis will likely impact your results. And unfortunately, osteoarthritis can not be treated with an arthroscopy. The presence of significant arthritis is a contra-indication to performing a meniscus transplant or implant. Thank you for your reply. It is quite devastating to hear that I am probably going to need a replacement knee at 43. If the arthroscopy doesn’t help and a collagene implant can’t be done, I don’t see any other option. I am a 45 year old male, very active (tennis, gym, some jogging, skiing) and my knee has been hurting a lot for the past three weeks after a tennis match. It’s not as swollen now but still very painful when walking and also at night, mobility is limited. The MRI reads: Complex tear of the medial meniscus with a radial tearing along the free margins of the anterior horn and body segment and a longitudinal oblique tear at the junction of the body and posterior horn segments, mild synovitis along the periphery of the meniscus. Full thickness/near full thickness cartilage loss along the peripheral thirds of the articular surfaces with underlying bone marrow edema subjacent to the meniscal tearing. The doctor recommended arthroscopy to remove the meniscus damaged parts. Because of work and travel schedule it would be a good moment for me to have surgery now but I don’t want to make the wrong decision. If arthroscopy is overall the best solution (considering also long term implications) I’m tempted to just go ahead and do it sooner rather than later. If for my type of meniscus tear I could still be active without an arthroscopy, then I would probably be patient and see if I can slowly go back to my normal activities. I guess, in a few words, my question is: what would be the best solution for the long term? Thanks for the very informative website. Not only is there a meniscus tear, you also have significant cartilage loss as well as bone marrow edema. The cartilage loss is a form of osteoarthritis … and the bone marrow edema is occurring because the cartilage is too thin (from the arthritis) and your bone is not pleased with the stress it is seeing. The bone is used to being covered in cartilage to protect it. When that cartilage is lost, the bone will be subject to increased stressed and respond by producing the edema which is fluid within the bone. 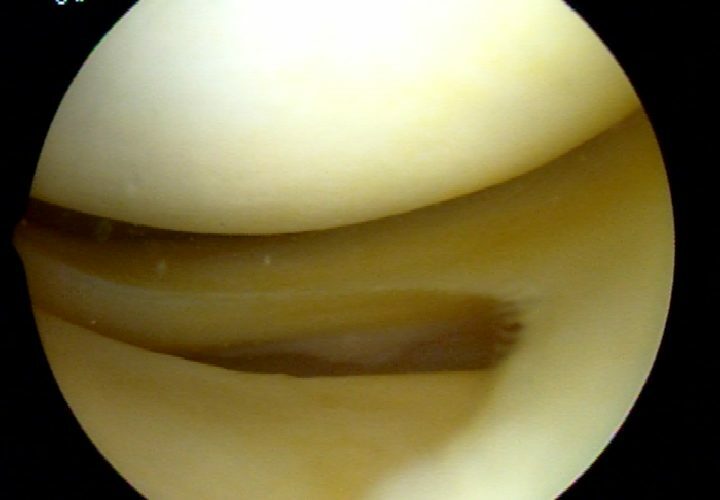 There are many possibilities that you can discuss with your surgeon… but just dealing with the meniscus alone may not be enough … and the bone marrow edema might continue to bother you and could worsen following an arthroscopy. I think you have some more details to cover with your surgeon. Thanks a lot for the immediate reply! I definitely need to have my condition further evaluated. From what I can understand I’m assuming that you are referring to the possible need of procedures like mosaicplasty ….I think I need all that good luck! Thanks again, if it wasn’t for your posts I would have probably rushed into the wrong, or not definitive, procedure. I suspect that I tore my mensicus about one month ago, no buckling, popping or giving way but very painful and stiff after a soccer game. I’ve had a previous tear in the same knee with similar symptoms and had surgery to repair it but really wasn’t too happy with my recovery since I am sure it worsened my arthritis. About a week after the soccer game I saw my ortho who felt my exam was unconvincing and since the pain and stiffness had significantly decreased, conservative measures were all that was needed. A few days ago, I took a run and the symptoms totally returned with a vengeance. Did I not give it enough time if in fact it was a meniscus tear that could heal on its own? How long should I lay off the aggravating activities (tennis, running) to ensure the best recovery possible? I am continuing with swimming and leg strengthening exercises. Thanks so much in advance for your advice. A new set of X-rays and a good exam are likely to be your best next step. After 2 rounds of cortisone shots and worsening knee pain MRI shows an anterior meniscus tear and a cyst etc. My surgeon suggested arthroscopic surgery but said it still might hurt then he would try another shot asking the question “can you live with it”? I’m 54, can I benefit from physical therapy to possibly control the pain and symptoms? Is there any reason not to have the surgery or is it the only way the loud popping noise will stop and range if motion is going to come back. Thank you so much for this site! It is so informative. Thanks for the kind words. Without knowing if there was arthritis present it is hard to comment. Knees that have arthritis and a meniscus tear are usually best treated with therapy. And the popping may not go away after surgery. If there is no arthritis present and the meniscus tear is large, or there is a loose flap, then there is a chance the popping will go away. But that’s not a guarantee. I hurt my knee during my workout just over two weeks ago. I had an MRI and my doctor diagnosed a Meniscus tear. He said the rest of the knee looked good, no signs of arthritis. He suggests surgery. The pain is mild with occasional moderate ache that comes and goes. My biggest symptom is that when I walk with a normal stride, my knee pops, many times a double pop with every single step. If I walk with a bit of a stiff knee, I can avoid it a little. Can the tear heal enough on its own so that this popping goes away? I am 50 years and would like to be able to resume my workouts and maintain and active lifestyle. Very common problem. As I said in the post, the main issue that brings people to consider surgery are mechanical symptoms. Popping, locking, etc. Otherwise, without mechanical symptoms most people tolerate the pain well after a short course of therapy or rest. I got my MRI done and the result they show me was SUBTLE DEGENERATIVE TEAR AT THE INNER MARGIN OF THE MEDIAL MENISCUS BODY, associated with mild extrusion. Articular surface ierregulartity is seen at the weight-bearing surface of the medial femoral condyle measuring 10×20 mm anteriorly and 4×6 mm posteriorly medial collateral ligament in intact. Dr. Luks, I’ve found your website very informative as I learn more about my knee issues. I am a 26 year old fairly active woman, and a former figure skater. My right knee (landing leg) took a lot of abuse back then, and hasn’t been quite right since (~9 years now). Earlier this year, I started experiencing more issues with that knee – loud popping noises when bending it, and a throbbing ache/stabbing pain after activity or on stairs/hills. Sitting with my knee bend (in a chair/car) for long periods is bothersome as well. I tried physio for a few months while waiting for the sports medicine specialist, MRI, and then orthopedic surgeon referral (our health care system in Canada is SLOW). My MRI report states that I have a horizontal tear of the posterior horn of the medial meniscus, pretty much all the way through. I also have some cysts in and around the tear. I am waiting for the surgery appointment, as my surgeon thinks it’s a bad enough tear that we need to do something. I do agree, given that it is affecting my quality of life. However, I am worried that given my age, and the fact that the tear is right through, it may mean I lose half the meniscus if it is not repairable. I know that puts me at significantly greater risk of arthritis later in life. Just curious what your opinion might be? Hi Kyla… thank you for your kind praise. Over the last few years many sports medicine docs have been fixing horizontal cleavage tears. This has been a very active topic of discussion at many recent sports medicine conferences. Hopefully you have an Orthopedist who is willing to give it a try, and is well versed in what the current trends are. You are correct, at your age you want to save as much meniscus as possible. Thank you Dr. Luks for all information on your site. I do have a question regarding meniscus tears. There is mention locking or catching symptoms attributed to meniscul tears. This is not specific. With regards to the “catching”. What is catching, the patella or femur/tibia joint? My knee cap “catches” when I extend my leg but my doctor thinks its my quad (VMO) muscle imbalance due to lumbar L3 nerve root compression. I also have meniscal tear and am debating whether to have surgery. If this is not reason for catching, my pain symptoms are not bad and I have no swelling. So to recap: what is popping and catching with meniscus tear(s)? Catching in this context is a flap or loose piece of meniscus getting caught .. it would not have anything to do with your patella. Your doctor should be able to give you a better idea about what is getting caught. My radiology report says I have a Tiny Oblique tear within the periphery of the posterior horn of the lateral meniscus and additional postsurgical changes of partial lateral meniscectomy at the level of the body segment What does this mean? Do I need to get surgery again on the lateral meniscus and clean this up? . When ever radiologists use the word “tiny” then there is a VERY little chance the surgery will be necessary. Is it possible, that a meniscus tear does not appear on the mri scan? And if it IS a meniscus tear, but it does not show on the mri – does it mean, that it´s a small one, that will heal up by itself? Sadly there must be some arthritis or “degenerative” changes on the x rays or MRI. That is a likely source… But without seeing you it’s only a guess. Thanks for your answer. I am 50 years old, so I guess “degenerative” is likely. However, the doctor told me after looking at the mri, that the cartilage looked healthy. The funny thing is: when I go to the gym, I can do squat, leg extension, even lunges. Only when I try to run, the problem comes back. I am so confused! I am 48 and involved in competitive sprinting. Back in November I changed my starting leg so my right leg was forward. My right knee started bothering me so I changed back to the left leg. Since November I cannot bend my right knee fully without some pain. However it does not bother me when I sprint. About two weeks ago I woke up and the knee was really stiff and it was hard to walk. I stopped exercising for about two weeks and now only have slight pain but still have pain when I try to bend the knee. The MRI report said: Cartilage is intact. Tiny curvilinear areas of increased signal in the posterior horn of the lateral meniscus approach but do not convincingly reach the inferior articular surface. Findings likely reflect intrasubstance degeneration. Tiny oblique tears are not entirely excluded. Doctor wants to refer me to surgeon to discuss a possible scope. I asked if I could still sprint and the doc said if it doesn’t hurt then go ahead. I have never had a knee injury and don’t want to make things worse but really want to go back to sprinting. Will the tear get bigger if I continue to sprint even in the absence of pain. Over time will I be able to fully bend the knee without pain or is some type of surgery in my future. I just don’t know how serious this type of injury is. Any insight you can give me would be really appreciated!! This does not sound like a serious finding Vikki. Tears can become larger… but then again they may not. It is unlikely that these “tiny” tears are the source of your pain. Good Luck with your Ortho visit. Medial Compartment: MCL is intact. Complex radial tear of posterior horn with 1.0 cm maximal transverse separation. There is 5 mm meniscal extrusion. tiny inferior parameniscal cyst formation paralleling the mid body and posterior body. Complete femoral tibial loss at the lateral compartment with near bon-on-bone apposition. Subchondral cyst and bone marrow edema. Moderate marginal osteophytosis. Lateral compartment: Laterial collateral ligament complex is intact. No lateral meniscal tear. No cartilage defect. Mild marginal catephytosis. Patellofemoral compartment: Focal superior trochlear mid full-thickness cartilaginous loss measuring up to 5 mm (transverse). Full-thickness loss of the medical patellar facet. No subchondral cyst or bone marrow edema. Patellar cartilage is preserved. Normal patellar and traochlar morphology and alignment. After trying to understand these terms, looks like the damage is mainly confined to my medical compartment. What are my options? I am working on losing weight and eating healthy. It is unlikely your surgeon will recommend treatment of the meniscus with an arthroscopy. You actually have very severe arthritis as per the report (bone on bone). This needs to be treated as an arthritic knee… with a degenerative meniscus tear complicating things. PT, stretching, light exercise, etc tend to be the preferred treatments for now. Hi, My son is 16 years of age and he injured his right knee from Football 3 months ago, the first 2 months of injury my son’s knee kept on locking and clicking. His walking is fine but cant bend his right knee. The MRI result showed that he has a small oblique tear at the posterior horn of medial meniscus. We are waiting to see the orthopaedic surgeon in April. Is this tear repairable or can the Osteopathy help with this Sports injury. Most all tears at 16 are repaired (sutured). I would rather have someone fail a attempt at repair than loose a piece of meniscus at that age. children can heal many tears (after we suture it back together) that adults can not heal. Hello, I’m 15 years old. I injured my meniscus couple times while playing soccer & Judo couple months ago without knowing that I tore it. Doctors told me not to worry and said that I only pulled a muscle. When I finally got it checked out by a specialist, she told me that my meniscus was torn and appointed an MRI. The MRI result showed that there is a complex tear involving predominantly the posterior body and posterior horn of the medial meniscus extending into the vascular zone and near the posterior root attachment. No displaced fragments were noticed. I injured my meniscus in October, 2014 and then re-injured it again in December, 2014. Some doctors are saying that it will heal up on its own and then I will be able to carry on with Judo and soccer in couple months. My family doctor thinks otherwise and said that I will need a full on metal brace if I will want to play any sports even when it will heal up. He says that if I will tear it again then I can screw up my life completely and have lots of complications. As a guy I find it hard to just sit around and want to stay active and fit so don’t really know what to do. So I wanted to find out specifically if I would be able to carry on with judo and soccer right after it will heal up which will be after July and would I need a metal brace at all? Thank you in advance. We do not typically brace people for a meniscus tear. Once healed, many will be able to return to their chosen sport without issues. Some tears will require suturing to help it heal. My 18-year-old son hurt his knee sliding into a base, has slight pain and swelling. He got an MRI, and the results came back as a peripheral oblique tear, posterior horn medial meniscus. Is surgery necessary to fix, or is this tear something that can heal on its own. He plans to continue playing baseball and wants to have a successful result. Thanks for your professional opinion. HI Diane … Some meniscus tears can heal in children. Others might go on to require and arthroscopy to put a few sutures in it. We try VERY hard not to remove any meniscus in youngsters due to the increased risk of arthritis later in life. Hi Dr. Luks. Thanks for great info. Trying. To decide best decision from MRI for these impressions:. Oblique horizontal tear of posterior horn of medial meniscus communicating to the superior articular surface; small joint effusion, mild degenerative chondromalacia involving medial Compart. ACL PCL MCL LCL distal quadriceps & patellar tendons all intact; lateral meniscus noal size shape w/o tear or discord. Medial meniscus abnormal as stated above. Sml joint effusion, no popliteal cyst or suspicious marrow; mild thinning of articular cartilage in medial. Lateral comp fairly well preserved & patellofemoral articulation unremarkable for age. I’ve been on Ibuprofen 600mg for almost month for pain /swelling. Declined steroid inject due to past issue(not knee) affecting retina. Undecided on what to do to avoid more serious problems sooner or later. I’m in pretty good health as 68 y/o 5’4″ 132lb very serious about diet & wisdom in exercise. Thank you. Hi Dr. Luks, I am a 25-year-old female who has been running long-distance since age 14. I hurt my knee about two years ago. I stopped running for about 6 months to rest it, but when I resumed running I once again felt a sharp pinching pain in the lower medial aspect of my knee that appeared after about one mile of running. I got an MRI last year which stated: “Possible small horizontal tear posterior horn medial meniscus. Small joint effusion with slight thickening of medial plica.” I tried some physical therapy but the pain persisted. It is about a 3-4 out of 10. I know you had mentioned that tears in teenagers should be repaired. The orthopedist I saw stated that the tear I have would have to be removed because it is not a repairable tear. I am going to try to strengthen my quads and hamstrings with weight training over the next month to see if that helps. If muscle strengthening does not help, do you recommend that I have the arthroscopy and remove the torn part or continue running with the pain? Would the removal of the tear increase my chances of osteoarthritis later on in life? Is the tear described possible to be repaired? I hope to continue running as long as I can, since I enjoy it very much. First .. it does not sound like a tear that would bother you… if the radiologist is saying “possible” that would mean it is very small, if it present at all. Second… if it was a painful tear in a 2- something, then yes.. many of us are repairing those these days. A plica is also a known cause of medial knee pain. 1. Full thickness 1cm posterior root attachment tear of the medial meniscus with subluxation of the body in the coronary recess continues as a half radial tear in the posterior horn. 2. The lateral meniscus is intact. 3. Moderate to severe patellofemoral chondral. 4. Moderate to severe medial compartment osteoarthritis. I am undergoing weekly PT and 4 times a week exercises in a hot therapy pool. I am 63 years of age having played a fair bit of social golf over the years. While the long term prognosis may suggest knee replacements due you think with exercises etc I should be able to get functioning again if I am patient or is some form of surgery the only way. Thanks for your help. It’s possible Chad… exercises, a compression sleeve, physio, TIME :-), should provide you with some relief. This is not a root tear that should be fixed with those MRI findings. I have heart felt praise and appreciation for your expertise and willingness to clarify questions that sometimes other orthopedic doctors don’t do. I’m 53, PE teacher and coach, active and and, my body is my career. College BB athlete, 4 R knee surgeries, last one 18 years ago; Ive been blessed and lucky. ACLrepair that failed and then a successful reconstruction using hamstring tendon and two meniscus surgeries, mostly medial. Tweaked my knee 10 weeks ago and have been on crutches and going through physical therapy. Finally had an MRI authorized and it says……vertical tear of the posterior horn of the medial meniscus extending into the root. The body of the meniscus is peripherally subluxed. Does this finding mean I have a full-thickness root tear? I will see the doctor in a week and a half and I am so nervous. Is there any way this can heal on its own if I work hard and am patient? Will PRP help? I can’t imagine having a 5th surgery or even a knee replacement. Any thoughts? Thank you most sincerely! IT does sound like a root tear… but it sounds like a root tear in the setting of degenerative arthritis from your prior injuries. Many of these tears can’t be fixed, or don’t need to be fixed if there’s already significant arthritis present. PRP might help alleviate some of the pain, but it will not fix the meniscus. There have been a few papers on the use of PRP into the knee. Some show success at decreasing inflammation, some show that it will prevent further cartilage degradation, while others show no effect at all. Issue: we are not often comparing apples to apples in the PRP world. There are many different ways to prepare it, etc. So, yes we are using it. Yes, I find that it helps patients with arthritis and tendonitis best. But I am still waiting for better quality studies to come out. I am 43 and began running about a year ago. The MRI comes after my 2nd incidence of finding after and otherwise uneventful run that I could barely stand the pressure of walking afterwards and followed by 2-3 months of not being able to run before the pain subsided. (i.e. I could not run from Oct-Jan and now most recent incident was April 19 and still in pain though I have not tried to run at all) Currently, I find elliptical, exercise bike and even just routine daily walking painful. I noted that you seem to discourage surgical repair for this type of injury, but am wondering what exactly that means for someone like me who is periodically sidelined from an otherwise active lifestyle. It is not likely that simple fraying of the edge of your meniscus is the source of your pain. Longstanding pain will usually be associated with larger, loose flap tears of a menisicus. There are many other reasons why a runner will have knee pain. Other potential causes are stress fractures, ITB syndrome, Anterior Knee Pain Syndrome, and a few other common problems. Indication: Knee pain and history of prior ACL reconstruction. New injury with pain. hemarthrosis, though the position of the knee joint is limited. Impression: New large effusion. Significant ligament injury may have occurred. mri report-INTERPRETATION: On comparison to the prior study performed on 4/14/2014, the patient is noted to be S/P anterior cruciate ligament reconstruction. An intact graft is not identified. The minimal bone marrow edema previously identified within the lateral femoral condyle and proximal tibia are no longer present. The posterior cruciate ligament is unremarkable. A tear is noted involving the posterior horn of the medial meniscus which extends to the superior and inferior articular surfaces. This finding is not previously present. There is no evidence of a lateral meniscal tear. A small joint effusion is present. Slight lateral subluxation of the patella is again noted. Irregularity of the anterior tibial tubercle is again identified. The adipose and muscular planes are well maintained. The subcutaneous soft tissues reveal no evidence of mass or edema. The marrow signal characteristics of the proximal fibula, patella and distal femur are within normal limits. No abnormalities are identified involving the infrapatellar and quadriceps tendons. There is no evidence of thickening or edema within the medial and lateral collateral ligaments. The articular cartilage demonstrates normal signal intensity and is within normal limits in thickness. S/P anterior cruciate ligament reconstruction with a probable torn graft present. Slight lateral subluxation of the patella. Irregularity of the anterior tibial tubercle suggestive of old Osgood-Schlatter disease. We, have not been to see the orthopedist yet. Is another surgery likely? It appears that another operation might be necessary. BUT .. I would read through this site on your graft choices. Very few of us use allograft or a cadaver graft in teens or twenty somethings because they have a much higher failure rate. You also need to find someone who enjoys fixing meniscus tears, not simply removing the torn piece. He already is showing some arthritic changes on the inner or medial side of the knee. IF he can’t have that meniscus repaired, then other options need to be presented to decrease the risk of arthritic progression. First of all, thank you for the website and all the valuable information.I am keen to avoid unnecessary surgery if possible. It has been 3 months however since I suffered a sharp pain while out running and have struggled with walking even the smallest distances/stairs slopes ever since. It has remained swollen for this time despite taking prescribed anti-inflammatories, and regularly feel clicks and pain in different parts of the knee. I’m 39, until this recent injury I was very active. Reconstructed ACL (2002) which is intact. Degenerative changes in the medial meniscus with a small under surface tear and the suspicion of a small radial tear between the body and the posterior horn in the middle third. Grade III chondral changes of the medial femoral condyle posterior aspect of the lateral femoral condyle with subchondral oedema. There is no collateral ligament injury. An advice you could provide would be gratefully received. I got my knee injured while playing football, so i went for MRI Scan. MRI report state that, the lateral meniscus is discoid, with contusion / degeneration seen in both horns, anterior more than posterior. The posterior horn is mildly attenuated, with a subtle flap tear at the junction of the both horns, at the periphery, extending up to the femoral articular surface. Marrow contusion is seen involving the mid lateral tibial plateau.I don’t have any problem in walking,running. Please advise is there any requirement for surgery or it can be treated if i take rest. Thanks for you advice in advance! Hi Steph… perhaps the swelling is due to mild degeneration or mild arthritis of the knee ????? IT is unlikely that an undersurface (incomplete) tear in the cause of your swelling. Pes bursitis is not uncommon in active people… it’s not caused by overuse of the medial structures… it’s simply one of those common overuse injuries very active people get. 2. Grade 3 patella chondromalacia most prominant laterally. Do I need a surgery for the radial tear? How bad is the condition. Any help will be appreciated. get the stress fracture to heal before you do anything else. there is a good chance that that is what’s bothering you. I seek advice. I have had removed most of my lateral meniscus now. First time a bucket-handle tear 9 years ago combined with a reconstruction of ACL. I was all fine until I twisted my knee and it started clicking. For half a year I tried to train, without it getting better. Then I had surgery February 2013, where most of my lateral meniscus was removed. Since then I have had trouble overstretching my leg without having a snapping feeling on the lateral side of my knee. It must be ITB snapping, and it gets better if I bend my hips before trying to bend my knee. Seems like it also helps when I train adductors and biceps femurs long head. I now had a scanning, and (with a risk of translating wrong from Danish to English) it says that there are major changes in the external joint capsule, especially as a result of the missing lateral meniscus. I would NEVER go for a new knee, I still strongly believe that some kind of training, balancing the muscles to help the joint bend in the right way must be possible. I need to add that I have NO pain, what so ever. But of course the snapping whenever I stretch my knee is not so nice, and I tend to stand more on the opposite side, which makes my body really unbalanced and overloading the other side of my body too much. Do you have experience from people missing the lateral meniscus, what training they have done to help them get through this change? In some people who had a substantial part of the meniscus removed, any remaining small pieces can snap or pop as the knee moves. It’s usually not caused by the ITB. Have your surgeons ever spoken to you about the possibility of a lateral meniscus transplant? I am 29 years old and from Australia :) I was told today I need to have an arthroscopy to either repair or trim my meniscus. I injured it three weeks ago in a netball game, it was swollen for three days, but I have since been doing physio, weights, walking and have no significant pain, just the occasional discomfort if my knee is positioned the wrong way/getting up sometimes. It no longer has any inflammation (none after exercise either). I have good range of movement, very low levels of pain but my surgeon told me every meniscus tear needs surgery. My doctor who saw my MRI said it was only a small tear and won’t need surgery. My physio originally said I would need surgery but after two weeks of physio he said maybe I wouldn’t. I had to have two MRIs as he couldn’t see my tear clearly on the first one. The report says I have undisplaced tears of the posterior horn and inferior popliteomeniscal fascicles of the lateral meniscus. No significant chondropathy seen in any department. No joint effusion noted. I don’t know what that means, but my surgeon wasn’t informative in my options, and basically said surgery is the only option. I’m not sure I want to have surgery straight away, as it doesn’t even feel that bad at all after 3 weeks, and would prefer to try physical therapy before surgery. What are your thoughts on what is he best course of action? I would like to be able to return to running. I just thought I would have more options but don’t understand how significant the injury is? Your surgeon is simply not correct… all meniscus tears do not require surgery. Nothing wrong with continuing your physio and monitoring your situation. Thank you so much for your reply. Is that type of tear typically worrying for an active 29 year old? With proper physio and massage, is the likelihood of it returning to what it was pre injury high? Dr. Luks, Thanks for your answer. But I do also have a 5 mm near full-thickness radial tear of the medial meniscus posterior horn/root. Do I need any surgery for that? How will it heal? Also The doctor said I have osteonecrosis in my knee….is there any treatment? What would be best recommended for such a condition? Is it possible to avoid surgery altogether? What alternative medical therapies might be worth pursuing? Please give me some advice.. I’m a 32 year old healthy female who enjoyed more than anything to jog and go for runs. I suffered a fall on some water an an amusement park and I hit my knee extremely hard. X-rays showed no fractures but I got an MRI done which impression reads grade lll tear of anterior horn of lateral meniscus and Grade II signal of the posterior horn of the medial meniscus. I haven’t ran in over 4 months which is such a great loss to me. I just want to run that’s all I want. I don’t particularly want surgery… What has been your experience with this type of injury. I have minimal if any pain. why aren’t you running now? Pain? Fear? Being told not to? I have not ran for fear of causing further injury. I am waiting to see an orthopedic MD to tell me what I should and shouldn’t do.. I’m willing to do my part.. Physical therapy., or even not running for as long as suggested if that is what will help… I’m looking for direction as to what to do or expect.. The times I have had to do some quick running minimal pain maybe mild soreness..I’m a linear runner maybe some incline no crazy sports just easy cardio for maintains health and weight… What do you think? Thank you very much for this really helpful information on degenerative meniscal tears. I am a physical therapist in my early 50s, have run many marathons, last half marathon in March this year. I think I have a degenerative meniscal tear, no locking, giving way or instability symptoms. With quads strengthening, etc and once pain symptoms have reduced would I be able to carry on running? I am aware that without the protection of the medial meniscus I may develop OA changes in future years. IF it’s not bothering you then there is no reason not to run. Most runners in their 50s likely have degenerative meniscus tears but simply don’t know it. i had inside meniscus repair few days ago and i am non weight bearing for 4 weeks i have to be in the brace all the time what i am worried about is as i was sitting on my sofa i my leg was straight and i put the hill down when my hill touched the floor i felt the pinch where actually my meniscus was repaired do i need to be worried about that? Thanks for letting me know it means a lot for me ! just want to ask you something else regarding my knee 2 weeks post op today and my knee is still hot and as i said had inside meniscus repair i do get aches/pain on the lateral side why is that pain over there is that normal or is something that i have to be worried about ? thank you again for you help! First, a 1000 thanks and then some, not only for your truly excellent and mega-informative website but also for this global query/answer opportunity: amazing. All that has helped me hugely, to get through my last three really draining weeks, once I found your site. Thankyou for your personal and professional generosity and service. I would so benefit from your input into the dilemma/decision I face with a medial meniscus bucket handle (?) tear. This is, most vitally, in the face of conflicting MRI interpretations, as well as conflicts both about surgery anyway, as you highlight, & in some other ‘reputable’ net research, even on naming of tears, thus on appropriate ‘fix-ups’. My aim is to be as well informed/prepared/responsible as possible for my 3rd (!) Orthopaedic surgeon’s consult, Wednesday morning, 21 Oct. My further aim is to avoid future total knee replacement forever, or defer hugely. Add in to the mix, the 28 Sep eye-opening ABC TV Four Corners program,‘Wasted’: thought-provoking! It’s primarily about systemic problems in the Australian government’s health care system, highlighting knee arthroscopies (& more) but showing gaps & problems in underlying patient/doctor/specialist information & communication: well worth a watch for any thinking patient & others, I believe: http://iview.abc.net.au/programs/four-corners/NC1504H035S00 till 28 Oct.
I’m another of your Australian fans, Dr Luks, a 67 yr young female, 165 cm (5’6”), 59kg (130lb), sadly way-too-sedentary, with multiple ill health problems. They include spinal osteo-arthritis, early onset osteoporosis (if relevant), & I now know, osteo-arthritic knees. Recent history: Late August, I noticed right knee pain, including catching and twinging, touch-tenderness, giving-way, decreased leg usability and a ‘clunking’ intermittent noise (like smooth driving vs running over a kerb). Pain worsened some by week 5, though improving at first with anti-inflammatories. Though I worked out I’d been working outside, and noticed it from that day, I noticed no ‘event’. About three weeks ago, I sure did, though. 23 Sep: Favouring the knee, eg not squatting, I was sitting app. 6” (15cm) from the floor, rt leg stretched out, stood up: immediate, pretty severe pain. I didn’t notice any particular noise/sensation: just pain, continuing very high for hours. 24 Sep: MRI said right medial meniscus bucket handle tear, flipped anteriorly and laterally. MRI details below*. It did not lock, & hasn’t, but I could bear no weight at all (& have been able to only this last week; two crutches till 15 Oct.) Oct 1, thankfully I now see, the scheduled meniscectomy/arthroscopy was cancelled very last minute (already prepped), from anaesthesia complications, ostensibly. O. surgeon left on planned leave, my extra pre-op queries still unanswered, no Plan B, though his staff had said initially it must be soon not on his return. Trying to find an urgent low cost replacement, I was very fortunate to get phone-only opinion from a leading O. surgeon, via my GP. He generously viewed the report & scans online. He said: “Don’t operate unless locking; no use, maybe harmful, slow healing; actually parrot beak tear, ‘degenerate’ ” (or degenerative/degenerated). His word is uncertain but I understand could mean different things in your world. It sure FELT “traumatic” to me, though I understand the existing degeneration counts! This seems a bit more than ‘frayed’ though. This surgeon seems pretty ‘top of the tree’, up to the minute & leading edge, couple of associate professorships. It is he I’m now seeing Wed 21 Oct. Meantime though: 2nd O. surgeon, in place from the search, saw me, said: bucket handle, no doubt, operate; radiology firm confirmed their original MRI interpretation (though the same doc); my GP states 8 out of 10 local O. surgeons would do the meniscectomy. Oct 16: I’m walking, but with not-normal gait, mostly without crutch, with some caution, variable pain managed with very little pain killer (slow release paracetamol only); sharp twinges at times, when I ‘catch’ it, in calf raises, steps. Pain is only in front, seems below knee cap, & front lower inner corner of knee, including to touch. All comment is so welcome, Dr Luks, to assist my best possible consult Wed. and then my final decision on surgery, but if possible including how a try-hard lay person gets to grips with differing diagnoses (! ), whether arthroscopies are worthwhile just to confirm diagnosis, prospects of ‘un-flipping’, how a bucket handle can flip both forward and sideways. This is v. long as I’ve gone for detail, hoping it helps. THANKYOU. A bucket handle tear can be a problem… even in people all already have some arthritis. The surgeon you quoted is correct… unless pain, catching, buckling or instability might be best to leave alone. BUT … if you have catching, locking, etc then the risks of falling are real. Therefore you can consider an arthroscopy. Even in 60 somethings… if the tear appears acute at the time of arthroscopy there are instances when it can be repaired… thus you will feel better and not loose and meniscus. Your surgeon should be willing to consider a repair, despite your age, if the tear seems repairable. I am a 20 year old female and have been having right knee problems for around a year now. I am in a lot of pain and whenever I extend my knee it cracks. Also it pops when I exercise and sometimes even when I walk. I just got an MRI that said “Tiny 2 mm focus of linear signal contacting the femoral surface of the posterior horn of the medial meniscus, possibly a tiny nondisplaced tear. Please correlate with any medial joint line symptomatology. No large or dominant tear.” What does this mean? Do I need surgery? I second the person before me and thank you for taking the time for making a very informative website and answering questions! I am a physical therapist, competitive runner, just turned 30, and really will do anything to keep the longevity of my knee! I have seen a few Dr’s in the past for recurrent pain to my R knee, however I have had conflicting reports at times. A brief history: recurrent bouts of medial hamstring tendinitis and pes anserine bursitis. Then, 2012 while running sprints on woodchip trails landed and felt pop in the posterior medial aspect my knee. It felt like my hamstring tendon, had s&s of hamstring pathology minus any bruising. Had a unremarkable MRI 1 month later, but did notice a possible bakers cyst in that knee. I got back to running, skiing, lifting weights with no problem. 18 months later, 2014 my knee started hurting insidiously again ( I was running a lot on snow however). Symptoms reminded me of pes anserine, but I had joint line tenderness also. I was able to run relatively pain free after a few weeks of rest. Had an MRI (without contrast) acouple months after initial symptoms. Radiology Report stated: abnormal vertical signal in far peripheral red zone and the posterior horn. I suspect a vertical tear of the far posterior horn of the medial meniscus largely extending to the femoral articulate surface. Body of medial meniscus normal. I saw 3 sports medicine ortho dr’s for opinions because one of them said it was a flap tear in the a vascular zone. Could reading of a MRI show that much discrepancy? Flap vs vertical, Avascular vs vascular? I was confused! Needless to say, I took a month off of doing anything that strenuously engaged my hamstrings. it got better, returned full time to athletic activities. Another 18 months later, or 6 weeks ago, it started hurting gradually over the course of a week. Again reminded me of pes symptoms. I ran a lot of speed intervals the next week and woke up one day withy out 1cm of swelling and primarily patella femoral symptoms. Over 3 days it felt a bit better, so I decided to do the race I had planned. It was a flat out and back course with no turns. I was able to do it, but the next day forth has been bad. I was unable to bend my knee or put much weight in it. Took several weeks until I could bend my knee open chain) with hamstring and joint line pain. 6 weeks and I still have pain with walking, running, medial hamstring activation ( which is very inhibited and has atrophied)….basically the last 15 degrees of extension with eccentric loading of hamstrings replicates my pain ( worse with closed chain, but also feel it in open chain). I have no pain with squatting, going up stairs, and keeping me knee fully flexed actually decreases my pain. I have to hold off getting an MRI for another month because of a move, so it has been stressing me a lot on what I should or shouldn’t do in the mean time! With my history, and previous MRI, could I have return that “partially healing torn meniscus”, if it ever healed on its own at all. Could the degenerative changes from chronic medial hamstring tendon issues lead to the meniscus tear/ preventing it from healing because I keep activating my hamstrings when I attempt to run/bike/swim. I know some fibers of the hamstring connect into the medial meniscus, this is why I am wondering! Very long post, sorry! But after seeing a few highly reputable orthos in the past, I’m nervous about what is the right path to take. Surgery, conservative, use of stem cells or prp injections. I have heard a mix of it all. Iwould really appreciate your thoughts on this! Thank you!! I think your follow up MRI is going to be important to see what has happened to the meniscus. Feel free to check back then after an exam and repeat imaging. Reading the posts and your response I find very helpfuk. I am 46 and went dancing at a wedding.l back in Sept. Line dancing involved alot of turns and by night I was in pain. Tha next day I could not walk. I went and got a MRI sbout 10 days later and it stated I had small moderate joiny effusion, tiny bakers cyst, synovitis, cartilage irregularity involving the patellofemoral compartment and tear posterior horn and midbody medial menuscus. Well the doctor recommended surgery but I read your post that same day. I scheduled surgery for mid november and wanted to give it a total of 8 weeks to see how it feel. Now I am walking better, much better and it has been 4 weeks since the pain started and I have 4 more weeks before surgery. I take ibuprofen every now and then. I have to position my knee a certain way when sleeping but it is getting better. I need to excercise and the weather is changing so i will need to walk real slow on a treadmill. I will see how well I am doing after walking on the treadmill gradually. Thank you souch for your advice because the doctor and people I talked to had me scared. I think you know the answer to that question… this is more often than not a quality of life decision. I would really appreciate your advice on this. I work in Africa, having surgery (as suggested by the doctors here) in home country would require some planning, and would like to make sure that surgery is an absolute must. – abnormality of linear signal of the posterior horn of the meniscus in contact with its internal tibial articular surface resulting in a decisive meniscal lesion of grade 3. The crossed ligaments are in place and have a normal morphology. Integrity of the tendons of the crow’s feet. No internal meniscal lesion. No intra-articular effusion. No abnormal bone structures. Conclusion: Grade 3 lesion of the posterior horn of the internal meniscus (this is a translation of the results). The local GP and orthopedist advise that surgery is necessary asap. Again, your advice would be very much appreciated. PS. I’m a 39 years old female and would like to continue to be able to exercise. Meniscus tears like this are certainly not emergencies. If the pain limits you then surgery to repair it (stitch it) is ok to consider. Exercises in one plane or direction are ok and generally well tolerated. Turning, pivoting, twisting, deep squatting might bother you and potentially (small chance) make the tear larger. Many thanks for the quick reply. This is my dilemma – the pain does not bother me, in general, but it did surface three times within a year. After the initial injury, it seems to be brought on by carrying something heavy. If I avoid this, would I be able to continue doing yoga, pilates without making the tear worse. And what does worse, larger tear mean? what would be the consequences of that. Thank you for your time. I am a 53 year old male. I have been exercising regularly for the past 15 years hoping this would help me not to follow the same destiny than my mother who had severe osteoarthritis at a much younger age. A few weeks ago I started to have a significant pain in my right knee. Besides a regular regime of daily soft exercise, I used to run 10 Km every Saturday. I thought that limiting it to a once-per-week frequency would help me keep my joints healthy while enjoying all the joy of jogging a relatively long distance. But after I developed the pain, I went to see my doctor and he ordered an MRI. In the MRI they saw a horizontal grade 2 tear in the medial meniscus with still a normal thickness in the cartilage. My doctor told me to wait and see doing a little bit of swimming and taking NSAIDs. I would like to ask you how can I interpret the finding in the MRI in layman terms. I mean, does a horizontal tear is a worse case than a radial or a complex tear? What does grade 2 implies? Thank you for posting your comments and the video. They are of great help. Meant to say blood flow aren’t bad symptoms:) also, I am 30 years old….so I know I’m starting to not heal as good as younger individuals! One more thing! Besides pain with valgus positions and tibial ER in a more extended position, I have pain with Sagittal movements. I am unable to perform hamstring stretches or hamstring strengthening as I get medial joint line pain. Also, if I try to run ( complete straight line on level ground), I have pain sharp pain if I heel strike but sometimes no pain if I run more forefoot or up uphill on a incline. Would these symptoms correlate with a meniscal capsular injury? Thank you for your insight! Last thing:) re-reading my reports it states MRI from 2014 had about a 10mm tear, MRI 11/2015 said no tear, MRA 11/2015 said about 15 mm tear. Don’t know if comparing MRI to MRA can truly show the change in tear. Btw, I absolutely agree with you how physical examination can be more accurate than imaging! Thank you Dr. Luks for the most informative site I think I have ever visited! Saw my orthopedist today, and while I am unable to provide the extensive details of some of the other sufferers, I can say he told me I have a compound tear in my medial meniscus and suggests surgery to remove the flap. I had a previous tear in the other knee and had Synvisc treatment that was miraculous! I mentioned this and he agreed we would try this action first. What is your feeling? BTW,I am 57 years old. Very active. I just got back from running 5 miles at the gym , which I do about 4-5 times a week in addition to some weight lifting. Thank you for the kind comments. If you are running and active, then you have many non-surgical choices before you. Surgery should be your last choice… it comes down to a quality of life decision. I have found your website perhaps the best on the web for understanding options on meniscus tears. Thank you. It seems a tear can be a life changing injury, but there are a lot of unknowns about this injury. a medial inner third vertical tearing damage. Medial Meniscus: oblique tear of the posterior portion with a separated and unstable fragment. Now, 49 I have had intense pain 2 days after a 3 hour steep mountain walk- the first in 6 months. I could not really walk on it. The joint is fairly flexible only the last 10-15 degrees is painful, but the pain on walking constant and vulnerable to any twist (particularly at night – when it wakes me up) and the pain at that point is extreme. It has got better over 4 days, but I still walk with a feint limp. The consultant said it looks like I am getting closer to an operation and pain will be a recurring thing and I can swap pain now for arthritis later. Questions: With an operation (say 10% removal) really end up in arthritis despite giving up all the stressful activities and just sticking to walking, cycling and swimming. I do want to walk in wild mountainous places though. Is there any point in delaying an operation now? The flapping bit of meniscus in on the way to detaching anyway. Does the cleaning up of the meniscus after cutting away the damage – prevent further tears? removing the offending flap is often enough to lead to improvement in your pain. You are still left with the majority of your meniscus, so, yes it can go on to tear again. It sounds like it might be the appropriate course of action for you to pursue. There is always a risk of developing OA .. but that risk starts to increase once the meniscus tears. AS long as the resection or removal is not aggressive then the risk shouldn’t be higher than it already is. I feel less pain now but i hear a popping sound when ever I climb the stair. Doctor told me I need a laser surgery. Do I have to see another doctor for a second opinion? Thank you very much Dr. Luks and looking forward to your reply. Do you think that you need surgery? Consider this a quality of life decision. Those “bone bruises” might be due to some arthritis. So there is no rush to consider anything.